I know what you’re thinking; this looks like a bunch of people getting ready to partake in some fun warm weather activity like boating or tubing. 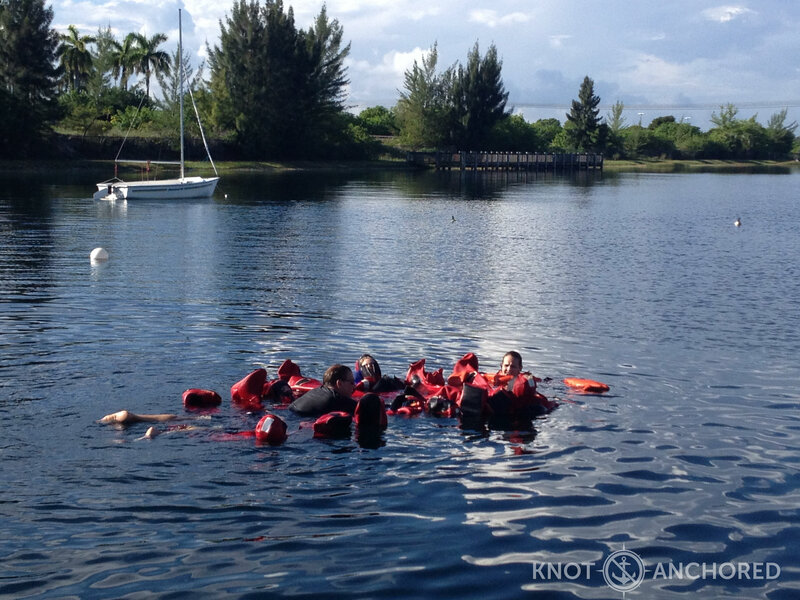 What we’re really preparing to do is our in water rescue course. Starting with 15 min of treading water – peace of cake for me (I’m a floater). I could actually hear Steve laughing at my buoyancy underwater! Swim test and then the dinghy flip. 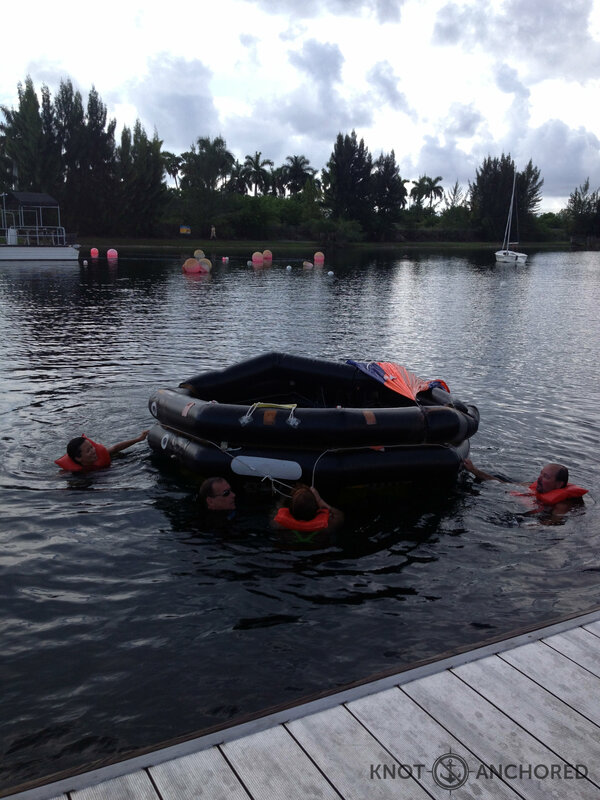 The life raft flip is an exercise where the Abandon Ship command is given and the life rafts are deployed. 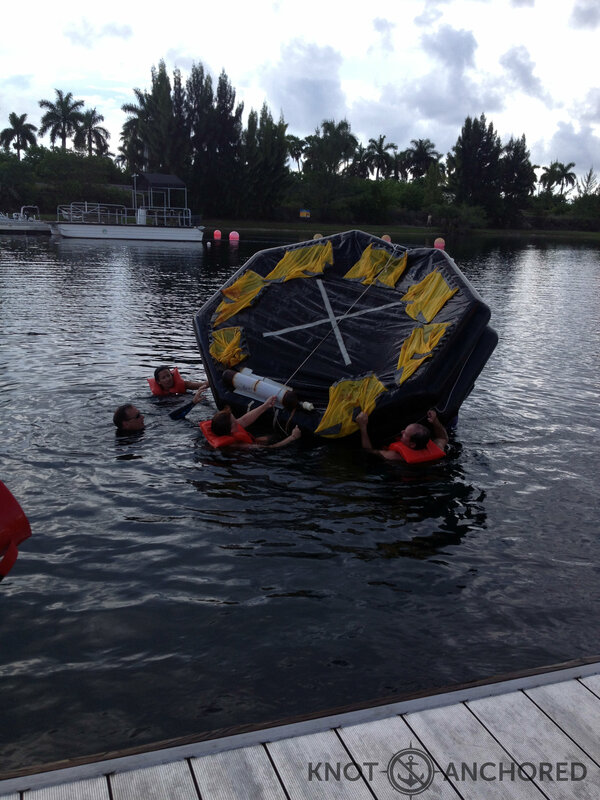 Apparently it is quite common for the life raft to deploy upside down. If you mentally put yourself in that situation you can imagine how upsetting it would be. Yes you could jump on top of the upside down life raft but if you didn’t have to why would you? So they taught us how to do that without knocking ourselves out with the CO2 container or drowning underneath it – which is nice. 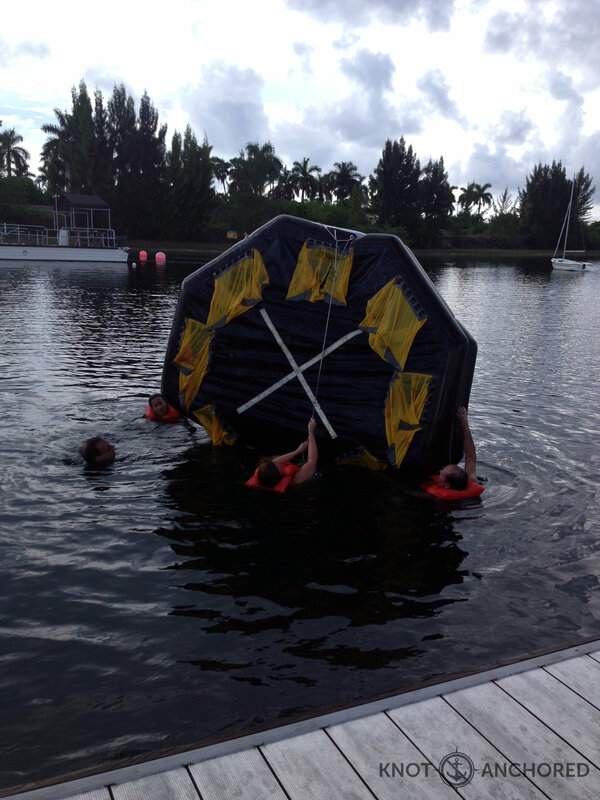 This was me (center) and Steve (right) flipping our life raft with Constanza and our Instructor Andre. Trick is to have the CO2 container on your side. 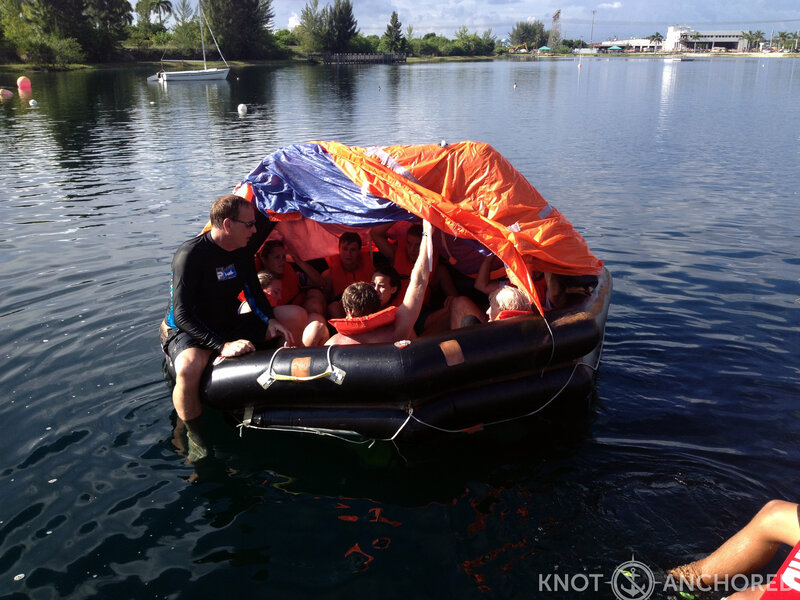 Also helps to have the life raft facing into the wind. Best not too knock yourself out with the ballasts (yellow hanging bags with weights). And not drown – which we didn’t. Keep in mind it was of course a 95 degree day and we were pushing it to the limit. This cozy shot was a hot one! 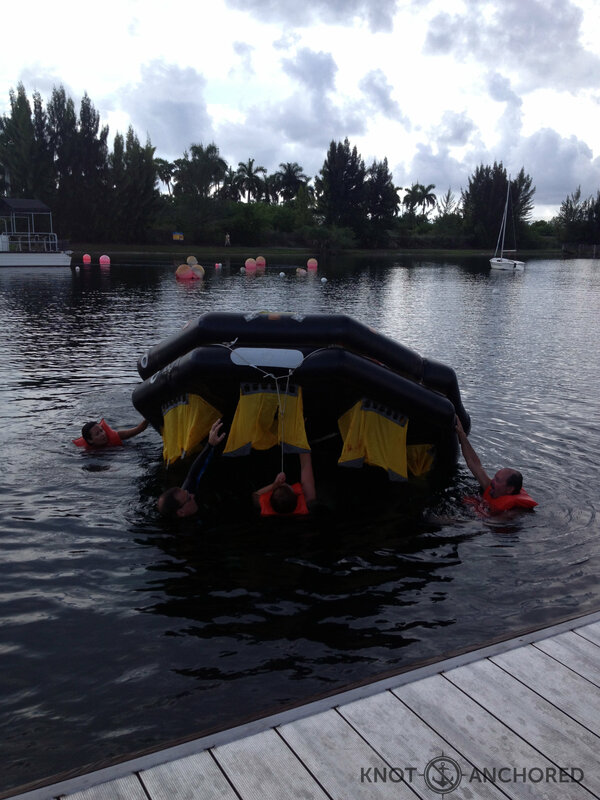 The following exercise was the immersion suit. Picture a buoyant one piece snowmobile suit complete with hood mitts and boots – a onesie in the truest sense. Getting into this sucker was easy for us – just like going snowmobiling. Now getting over the feeling that once you stepped off the dock this suit was NOT going to trap you and pull you to the bottom was another story. We did a few rescue exercises and got somewhat comfortable in our suits. This picture below shows our group in an alternating head to toe formation supporting a pretend injured person with our bodies as they lay over top of us. It was in fact our instructor and it proved just how effective that formation was in keeping both us and the ‘injured’ afloat. It was an exhausting day but really rewarding. Steve and I had grand illusions of staying up later then 9pm but that didn’t happen. 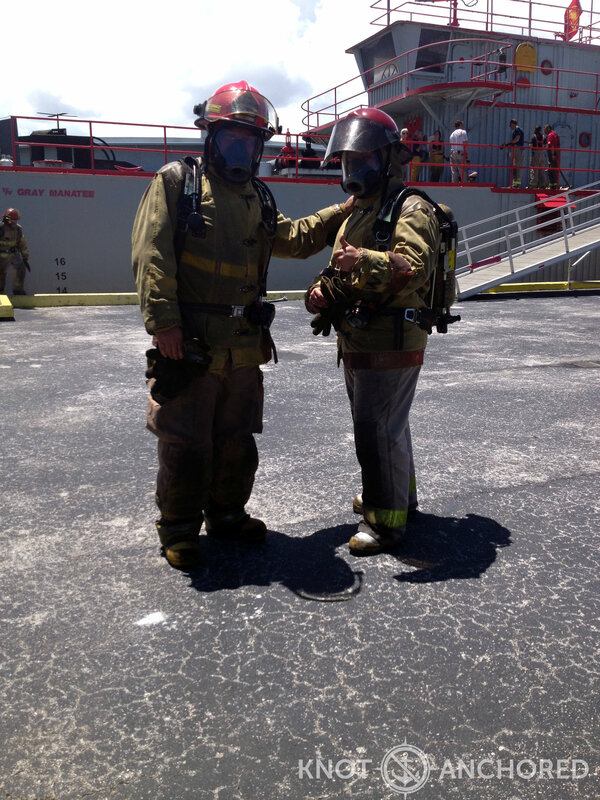 Next day was all in class Fire Search and Rescue. No problemo. Long day, lots of info but yet another great instructor – Matt. We were urged to start hydrating immediately for the following day as we were going to be working at the training site in full bunker gear. Our fire day began bright and early at 8am. It was insanely hot out. We broke into our Alpha and Bravo groups and started the day. They were right we were gonna get hot. Ya sure we’re smiling now cause its 8:30 and we’ve only sweat out 20% of our available sweat. Don’t we look cute! First thing on the schedule – grease and electrical fires. 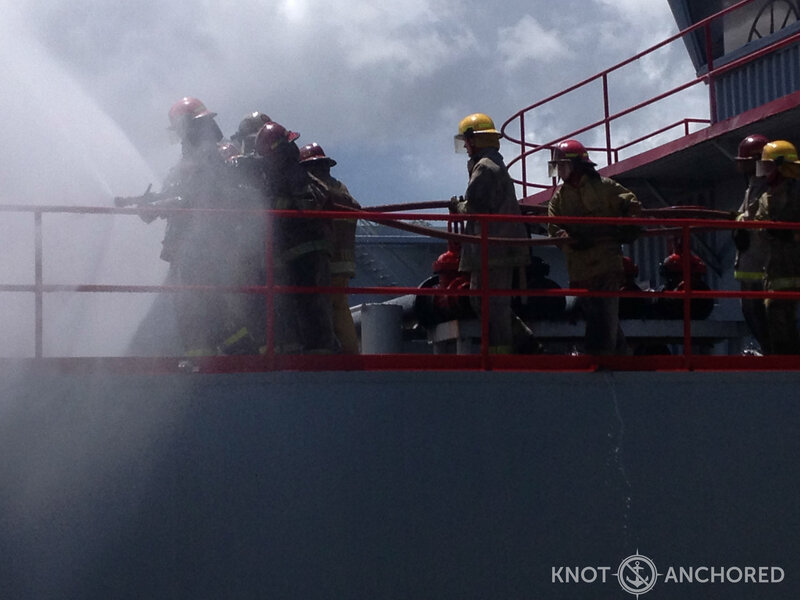 Here we learned the format and proper type of extinguisher to use in these situations – hands on. I had never used a fire extinguisher and was glad to get the chance to give it a go. Then they put us in a dark smoky room we had to find our way out of individually. There was no visibility and we had no idea what the room looked like in daylight. Crawling around there really gave you a feel for what its like to go through something like this; be it on unfamiliar grounds or not. You really had to put your faith in your instructor and just follow orders – otherwise panic was just beneath the surface. There was a great sense of unity among this class of 16 students and everyone helped and looked out for each other. This training pushed you emotionally and physically so we all elevated each other and remained positive. One of the scenarios we were given was that a helicopter had crashed onto the landing pad of the boat and was on fire in danger of exploding. 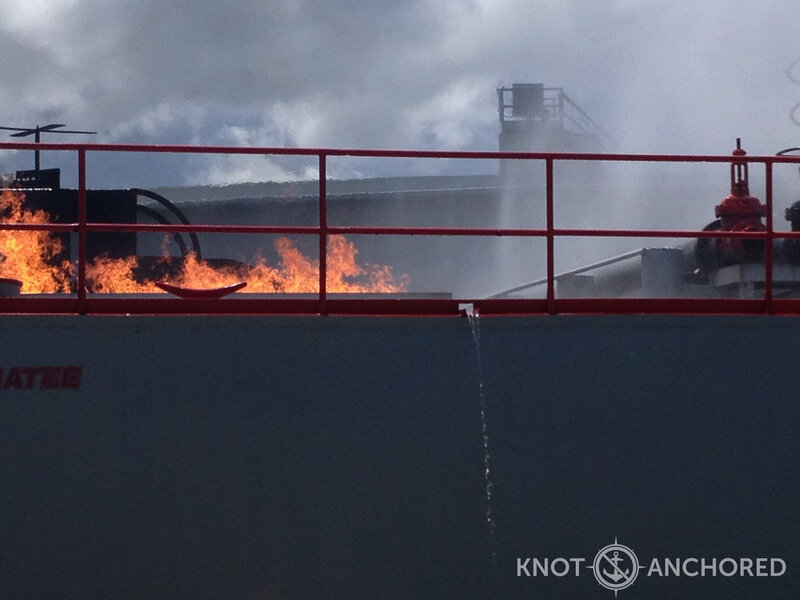 We were to fight the fire and diffuse any possible flare ups from leaking fuel. It was fun to do the whole fire hose bit. 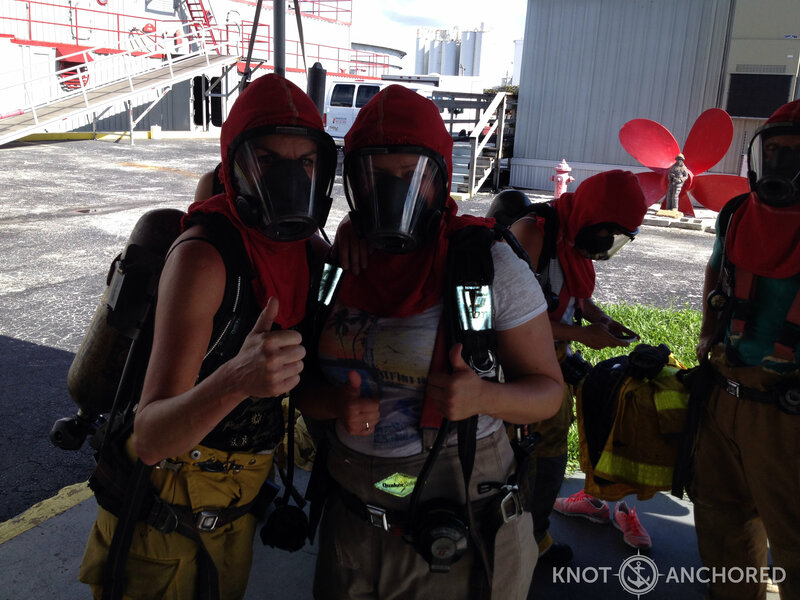 And super super hot with all that gear but we did it! We weren’t done yet nooooo. One last thing – the burn room. There is something completely unnatural about entering a pitch black room with a 6ft fire burning at the other end. Goes against every survival instinct. Here we were closed into a room with a blazing fire that was pitch black. Sitting down if front of the fire, fully equipped with pressurized air masks, our instructor went through the different stages of a fire and the best ways to fight it. The room got to 250 degrees and we were in there for 15 minutes. 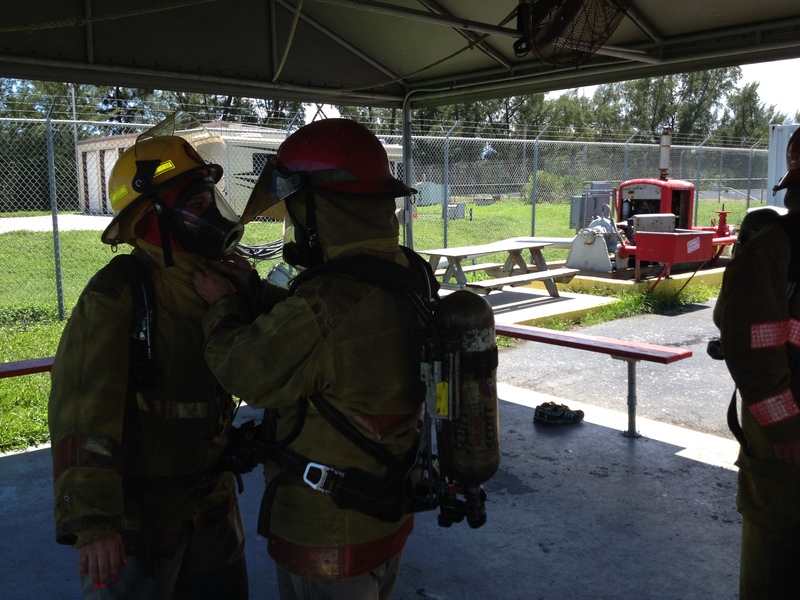 That’s a long time in a pitch black room on fire – instructor or not. It was great to get the heck outta there. Our final day was Friday and it was 1st aid and CPR training. Now Steve and I have taken this course before but have never enjoyed and absorbed so much information at the same time. This is good stuff. 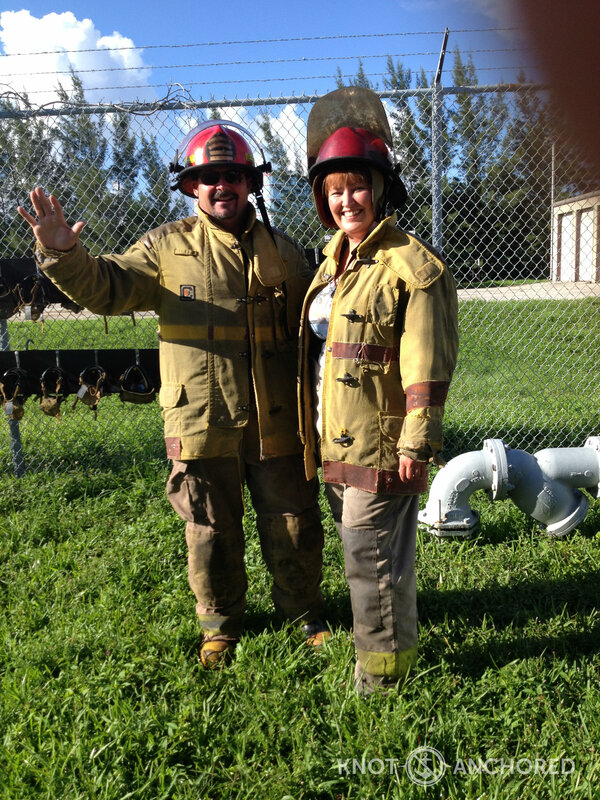 We want to not only have the skills required to save someone but the ability to retain that information – great class! 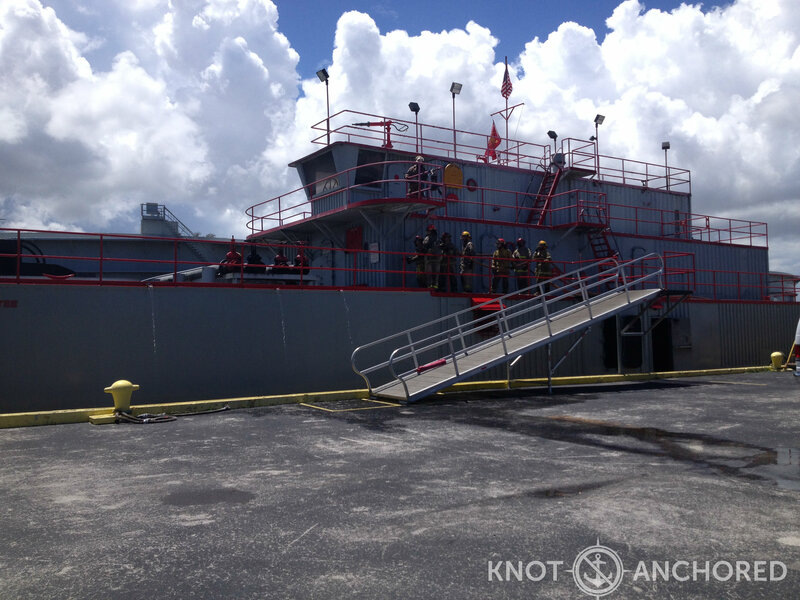 This multi faceted course enlists the help of active Marine, Airforce, Fire and Paramedics as its Instructors. They don’t just TEACH the course they LIVE it. 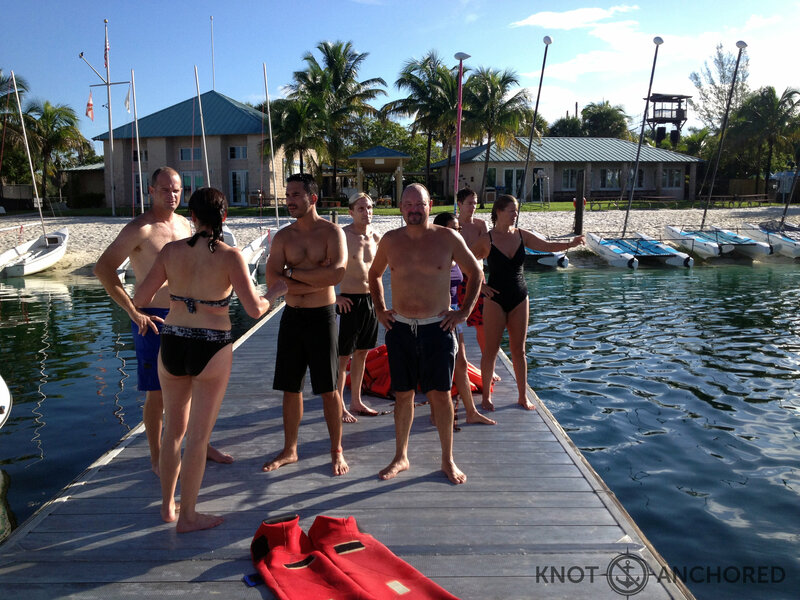 It was an honor to have such talent take the time to share their knowledge and life saving skills with us. Every instructor was amazing – thank you all! Our fellow students were also inspiring. Great to be surrounded by people taking positive steps to pursue or further their career of choice. We now hold in our hands the ability to save a life. Noteworthy: Steve got the higher mark on ALL the tests – way to go! Now onto our Radio Course and Advanced Medical for Captain Steve. Prev So You Wanna Work on a Yacht? Awesome fun eh Chris? I took all those courses for the Coast Guard. 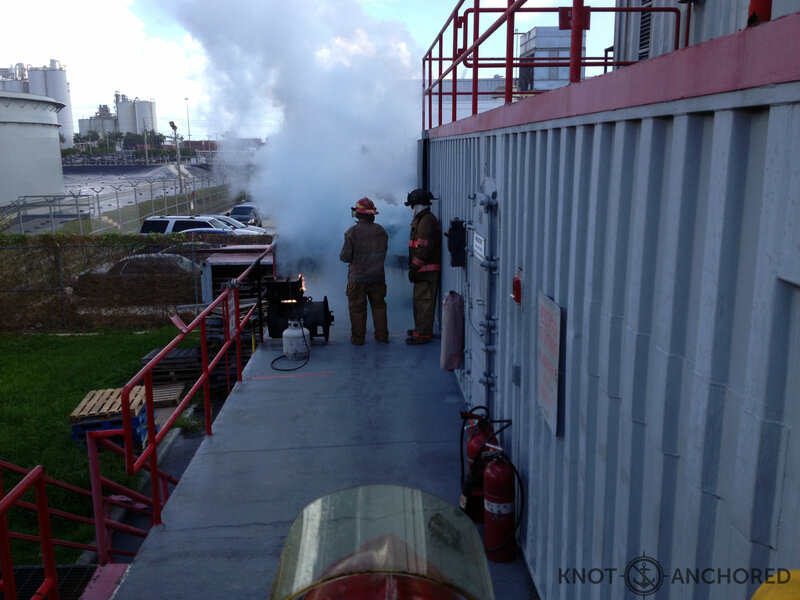 Can’t call 911 on a boat…you GOTTA put that fire OUT! Gayle we have a WHOLE new respect for all the emergency responders out there. It was fun and the instructors were the real deal.